This trusted book provides a focused, practical introduction to the key principles and practices guiding the operations of modern police departments. 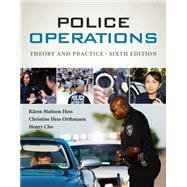 While maintaining its proven instructional approach and strong focus on community- and problem-oriented policing, the sixth edition of POLICE OPERATIONS: THEORY AND PRACTICE reflects the latest trends and research shaping the day-to-day operations of progressive police departments. A new "Perspectives from a First-Line Supervisor" feature shares practical, applied information. Highlights include new and revised information on evolving technology, the police officer hiring process, how police use websites and social media to communicate with the public, patrol techniques, cultural diversity, cell phone use and laws, hazardous materials response, federal emergency response agencies, and cyberterrorism. The authors complement this wealth of information with an appealing writing style, numerous photos and illustrations, and real-life examples to engage your interest, enhance learning, and demonstrate the professional relevance of chapter material. Now better than ever, this convenient book is an ideal resource for law enforcement students and professionals who want an accessible, up-to-date guide to essential principles and current trends and practices in police operations.